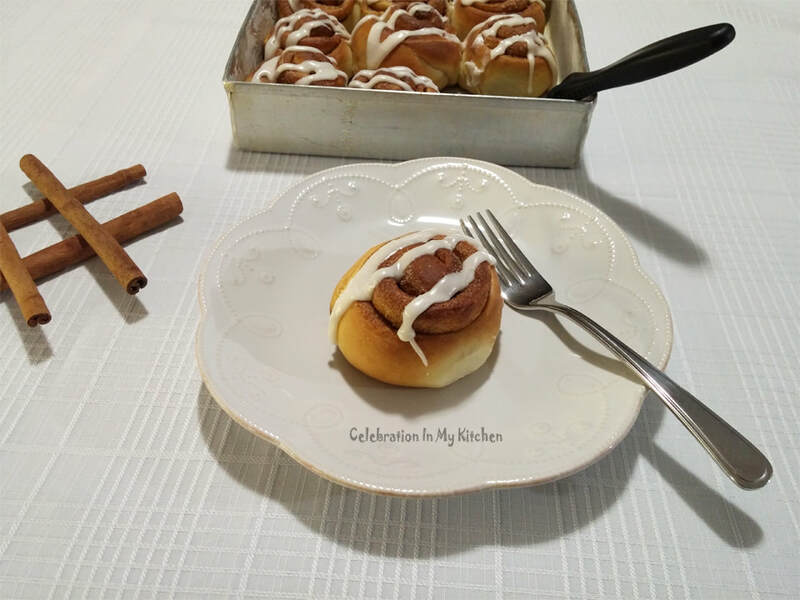 Having two sons gives me an opportunity to challenge myself and try foods that they love like cinnamon rolls. It may seem difficult and intimidating at first, but the rolls are easy to prepare at home. I have simplified the recipe with the ingredients coming together with a fork to form a dough. The icing is a basic one, which can be drizzled on top of the rolls when they are slightly warm. 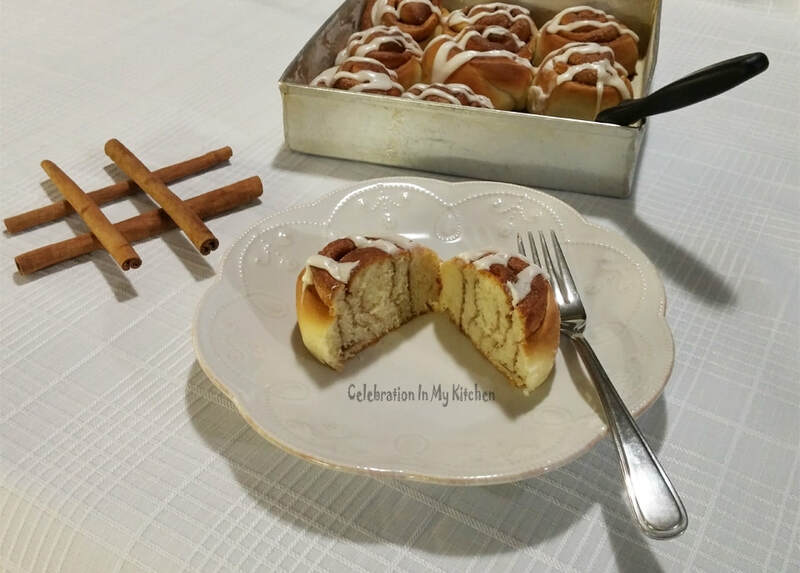 Sweet, soft and filled with the goodness of cinnamon, the rolls are true to its name. 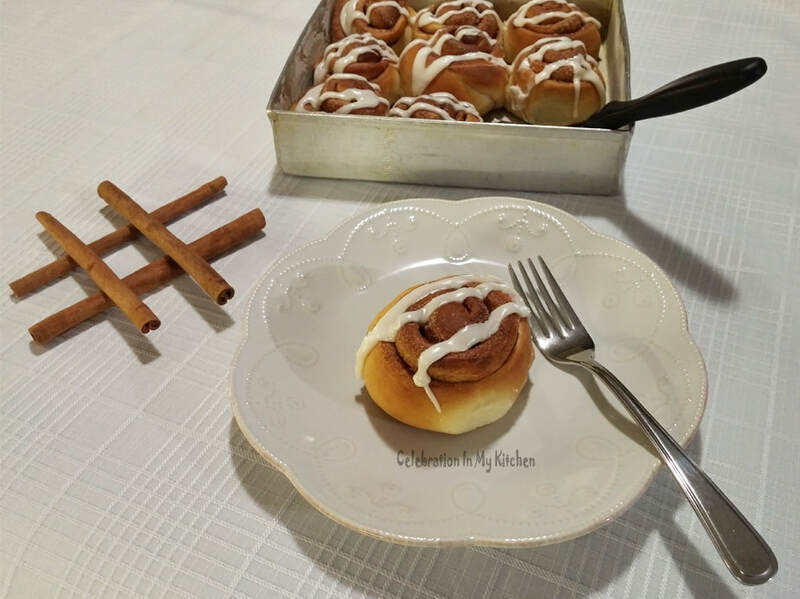 Moreover, the unbeatable aroma of freshly baked cinnamon rolls is tempting and irresistible. A yeast-leavened dough is set aside to double in a warm place, punched down, rolled out and brushed with melted butter. A mixture of cinnamon sugar is sprinkled on top, rolled and cut into equal pieces. These pieces are kept to rise for 30 minutes and then baked in a preheated oven. Cooled and served with an icing or glaze. Commonly eaten as a breakfast food or dessert. 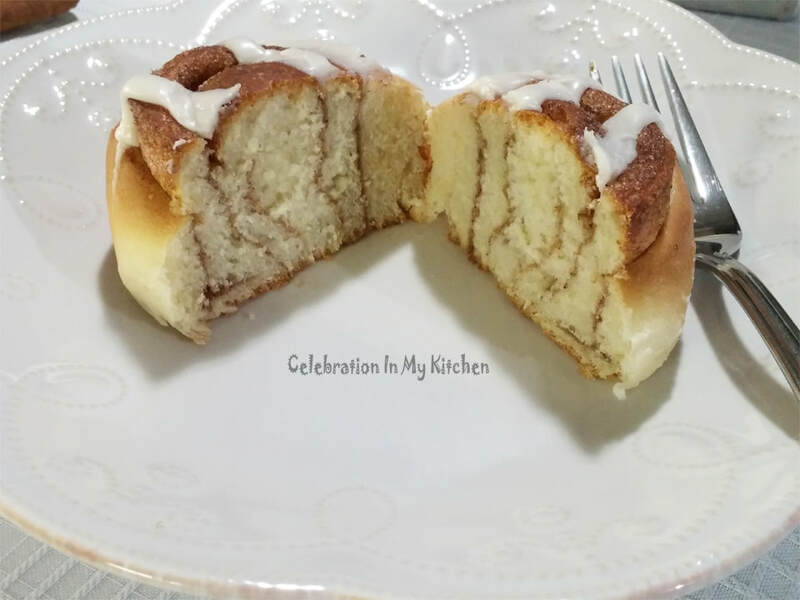 These rolls are often referred to as cinnamon buns or cinnamon swirls. Add the yeast to lukewarm water along with a pinch of sugar and set aside for 5 minutes to foam and froth. Microwave the milk with butter for 15 seconds till warm to the touch but not hot. The butter will not melt completely, which is fine. Sift 2 cups flour and salt in a bowl. Add the yeast, 3 tablespoons sugar, milk with butter and egg. With a fork, mix all the ingredients that will come together. Add the balance 1 tablespoon flour and knead into a soft, smooth dough. 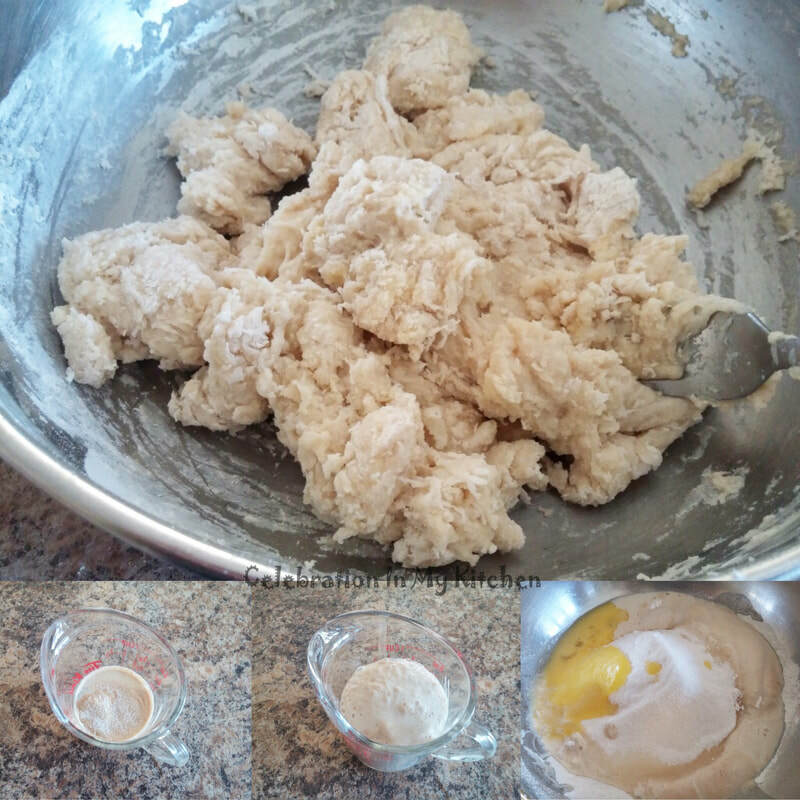 Place dough in a lightly greased bowl, turning once. Cover with plastic wrap and set aside to rise in a warm spot, until doubled in size, about 1 to 1 1/2 hours. Once risen, punch the dough down to deflate the air. Grease and flour 9 x 9-inch cake pan and set aside. 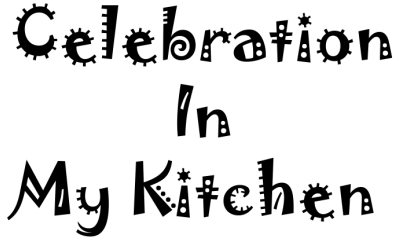 Dust some flour on a work surface and roll dough into 12 by 10-inch rectangle. Mix in the sugar and cinnamon powder in a bowl. Brush the melted butter on top of the rolled dough, leaving some aside to brush later on top of the roll. Then, sprinkle the cinnamon sugar over the butter leaving 1/2-inch border around the edges. 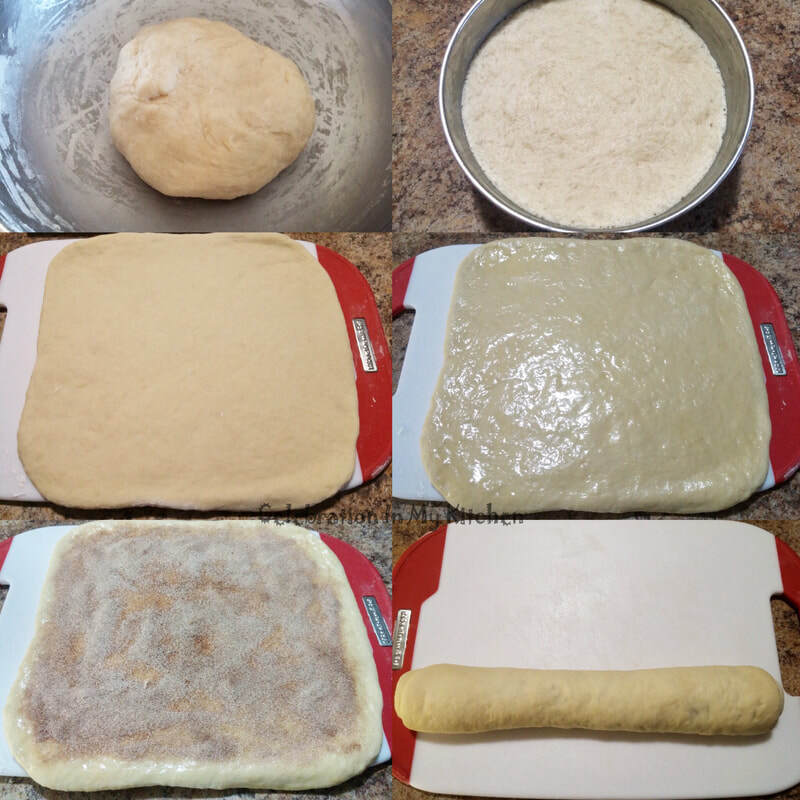 Roll up the dough starting from the long end to form a jellyroll. Firmly pinch the seam to seal and place the seam side down. Brush the reserved melted butter on the roll and then, cut crosswise into 9 equal pieces. Transfer rolls cut side down in the prepared pan spacing them apart from one another. Cover pan with a kitchen towel and let stand in a warm spot until rolls double in size, about 30 to 40 minutes. Bake rolls until golden brown, 15 to 20 minutes. Rotate pan halfway through while baking. Remove pan from the oven and let rolls cool. Prepare the icing by mixing in vanilla extract and milk slowly at a time for desired consistency. Transfer icing in a ziploc bag and close the top. Snip off one corner of the bag and drizzle icing over the rolls before serving. 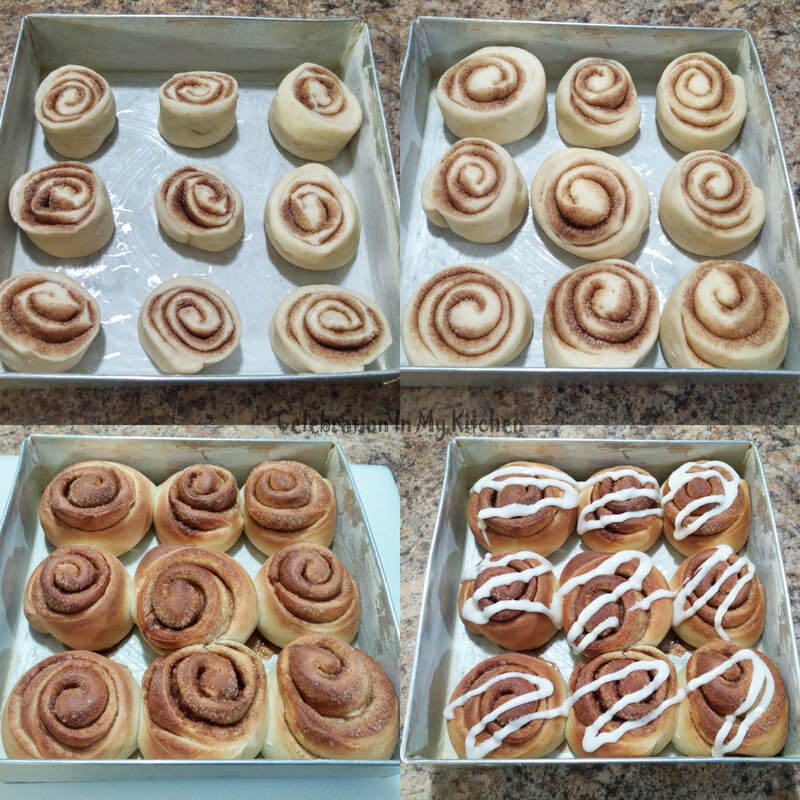 Icing was drizzled on the rolls when they were slightly warm to prevent the icing from spreading. Raisins or nuts (walnuts or pecans) can be included in the filling. Raisins soaked in rum and drained well can also be added for rum raisin rolls.